Annual screening mammograms are the most effective way to diagnose breast cancer. However, the Centers for Disease Control and Prevention said only 65 percent of women age 40 and older had a mammogram in the last two years. Screening mammograms are important because 1 out of every 8 women will be diagnosed with breast cancer during her lifetime, and early detection of that breast cancer can make a big difference in patient outcome. 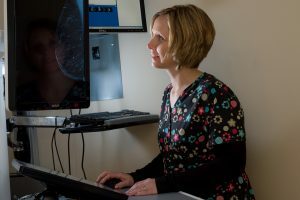 “The sooner you come in, the earlier that diagnosis, the higher the survival rate,” said Jacquelyn Thomas, RT(R)(ARRT)(CT)(M), breast imaging coordinator at Memorial Breast Diagnostic Services. Memorial Health System follows American College of Radiology guidelines for mammography, which advises women to begin annual screening mammograms at age 40. It is important that women come in for baseline screenings at that time, Thomas said, rather than waiting until they notice a lump or other problems. The latest technology, 3-D mammography, is now available at Memorial Breast Diagnostic Services in Springfield, as well as at Passavant Area Hospital, Abraham Lincoln Memorial Hospital, and Taylorville Memorial Hospital. The three-dimensional image of the breast tissue is clearer. It is performed in much the same way as a standard 2-D mammogram, requires no additional time and gives the radiologists an advantage in detecting invasive cancers. The complex 3-D image can increase early detection of breast cancer by 41 percent, which increases survival rate. Medicare, Medicaid and most private insurers cover the cost, too. Although women may feel some pressure on their breasts during the 10-minute screening exam, a mammogram should not be painful. If you do feel pain, it is important to speak up. Technologists are trained to make the process as comfortable as possible and can make adjustments to ease your discomfort. One misconception Thomas often hears is that women who do not have a family history of breast cancer do not need screening mammograms. However, more than 80 percent of patients receiving new diagnoses in recent years had no history of breast cancer in their families. This demonstrates the need for all women to receive screening mammograms. Thomas hopes women will think of having an annual screening mammogram as part of a healthy lifestyle, as important as a nutritious diet or getting regular exercise. Since physicians began recommending screening mammograms in the 1980s, the mortality rate from breast cancer has decreased more than 30 percent.